Disney's Star Tours - The Adventures Continue improves on the original attraction in every way—and sets a new standard for motion simulator rides. What had become a slightly tired trip to a Star Wars galaxy far, far away is now a giddy jaunt to... well, half the fun is you never know where in hyperspace the ride will whisk you. Thrill Scale (0=Wimpy, 10=Yikes): 4.5. Relatively mild motion simulator thrills. Those prone to motion sickness may experience discomfort (although closing your eyes should quell any queasiness). The ride also offers Star Wars-style action. It makes our list of Disneyland's most thrilling rides. Location: Tomorrowland at Disneyland and Disney's Hollywood Studios at Disney World. When it debuted at Disneyland in 1987, the original Star Tours was the first major motion simulator attraction at a theme park, and the newfangled virtual reality concept ushered in a new era for park attractions. If theme parks are about escaping from the everyday world, motion simulators offer an ideal means of escape. Using seats that move in sync with filmed action projected onto a screen, the destinations are only limited by the imagination of the attraction's designers. Star Tours was also a bold departure for Disney which, up until that point, had used its own content as the basis for its attractions. Since the ride film made its debut, developers have added Omnimax screens (such as The Simpsons Ride), roving motion base vehicles (such as Curse of DarKastle), and other features to enhance the you-are-there experience. The movie ride space cowboys at Walt Disney Imagineering, Lucasfilm, and Industrial Light & Magic (Lucasfilm's visual effects mavens), have upped their own ante with a retooled version of the attraction that launched in 2011. The impetus for the re-imagined ride dates back to the late 1990s when Episode 1 of the Star Wars prequel trilogy was being filmed. The infrastructure of the attraction remains essentially unchanged. Guests still make their way through a mythology-packed "spaceport" en route to their Starspeeder 1000 boarding gate and an allegedly uneventful journey to some friendly planet. Star Wars stalwarts R2-D2 and C-3PO are on hand to help ready the vehicles (and entertain riders stuck in line). After some pre-flight safety instructions, guests enter the familiar Starspeeder cabins and buckle up for a bumpy ride. Once the ride begins, however, it's clear that this is not the same Endor-bound Star Tours that lurched ad nauseam through the cosmos for 24 years. Speaking of clear, the super high-def clarity of the digitally projected film is remarkably crisper than the original ride. And by adding 3-D to the mix, the attraction offers a vivid sense of depth, while the dorky 3-D goggles don't noticeably dim the alluring brightness of the images. Unlike the gotcha gimmickry of most 3-D park rides, the extra dimension of the spiffed-up Star Tours is more understated. With its easy availability at the local cineplex, the novelty of 3-D has long since worn off. Wisely, the Imagineers have seamlessly incorporated the effect in a largely unself-conscious and elegant way that helps bring Lucas' alternate-universe to life. You Are There. But You Never Know Where. The most compelling improvement over Star Tours 1.0 is the ride's random sequence generator. By slicing together many different destinations and transition scenes, Disney says that there are over 50 possible story combinations. No two rides, therefore, would likely be the same (unless uber-fans boarded Star Tours a lot). That keeps the attraction fresh and makes it eminently re-rideable. It also makes other motion simulator attractions, with their fixed been-there, done-that plots, seem so 20th century. Like the original Star Tours (and nearly every other motion simulator ride), what all versions of the attraction have in common is that things very quickly go horribly wrong. Rookie pilots R2-D2 and C-3PO are unexpectedly drafted into action, rebel spies are discovered lurking among the passengers, and the Starspeeders must periodically engage in evasive maneuvers and travel to distant planets to avoid certain calamity. Other destinations include the ice planet of Hoth, Naboo, and the ominous Death Star. It's quite impressive to experience the attraction more than once and be treated to an entirely unique story arc each time. Different characters (which might include, among others, Boba Fett, Yoda, Princess Leia, and supreme baddie Darth Vader), different missions, different locations, and even different gags will have you marveling at the audacity of the ride. "It was a challenge to sync everything," says Spiegel, referring to the on-the-fly nature of the stitched-together film, the corresponding motion sequences, and the in-cabin effects. 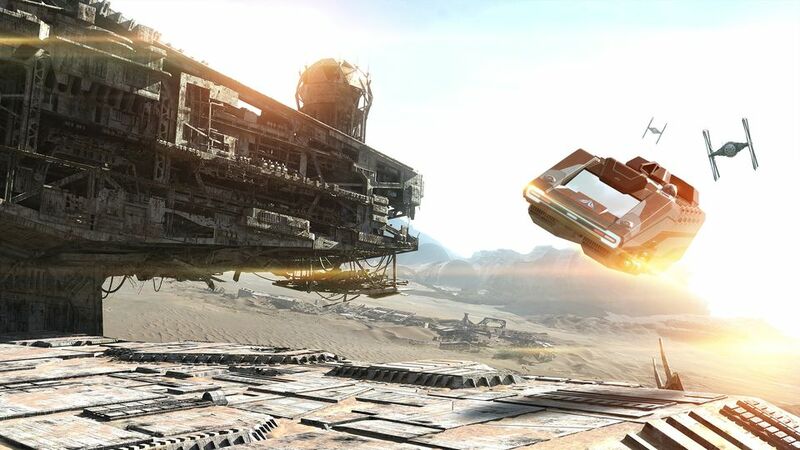 “We wanted to be able to take guests to many places in the Star Wars universe. And now we can." It may be some time before we actually have the technology to fly off to faraway stars. Until then, the mighty impressive technology that fuels Star Tours - The Adventures Continue can virtually transport us, if only for a few minutes at a time, to places that were previously unthinkable.